Last week's tornado isn't keeping Ennis from dancing. 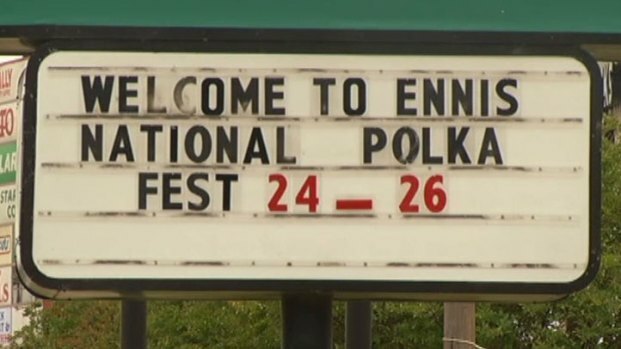 The 47th annual National Polka Festival begins Friday night as planned, even as Ennis continues to recover from the EF-1 tornado that blew through the heart of the small city. A number of businesses remain closed but hope to reopen soon. But others are in limbo, and there is concern that many historic buildings will have to be torn down. "We had some worries since so much of our downtown is blocked off, but our city has done a great job at redirecting the parade," said Puddin McCarty, owner of Puddin's Cafe. "I love that it's going down a neighborhood street. It will have a sense of community." McCarty said the recovery effort will also help ensure a strong turnout for this year's festival. "I think a lot of people are coming home not just for the polka festival; I think a lot of people are coming home to help support our community," she said. The polka festival is one of the largest annual events in the city and is a driving force for small businesses in the community. "It's a large event for our economy, because we fill our hotels, our restaurants are happy and also our retailers," said Jeannette Patak, Ennis Chamber of Commerce president. The Chamber of Commerce believes the festival is on track to maintain its financial boost to the economy. This year's festival has 150 vendors, the same as last year. The chamber had to turn away additional vendors for space reasons, Patak said. The National Polka Festival celebrates Czech heritage. It's held annually during Memorial Day weekend. The festival begins at 7 p.m. Friday with an opening dance featuring polka music and the King and Queen Dance Contest, where participants and nonparticipants are encouraged to wear traditional Czech kroj (folk costumes). The downtown festivities begin at 10 a.m. Saturday with a parade with floats, bands and colorful costumes.